I have, in the past done a review for all of the new sorts of Snickers Bars that are available, as it seems the Mars Corporation was using the brand to branch out into wild and wonderful new directions. Of course, after a while the essence of a Snickers bar can easily be lost--the days of simple peanuts, nougat, and caramel wrapped in chocolate are long gone--so you can only move so many steps away. Enter, however, the Snickers Chocolate bar. 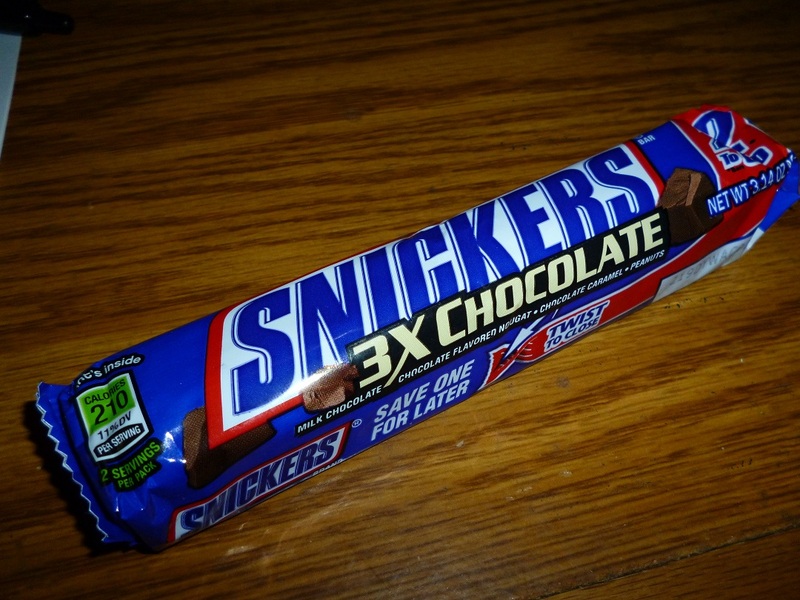 Actually, I think it's technically called a Snickers 3X Chocolate Bar, but whether that is its official name or just the work of some overzealous marketing department has yet to be determined. The marketing department also put the words "Save One For Later" on the wrapper, which means they have no idea what they are doing. I won't lie; I have been waiting a while to review this version of Snickers; I assumed that, given their previous actions, about six more variations were going to be released. Sadly, it does not appear that this is the case. However, it has been an excellent excuse to buy one of these bars, keep it "until I can review it," wait two weeks and then eat it, and then buy another "until I can review it." Ahem. Anyway, that should give you a pretty good indication about this bar--I like it. 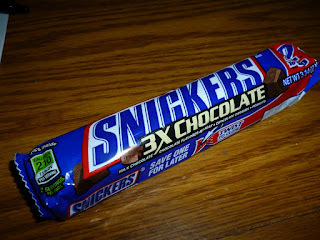 In fact, I am pretty sure I like it more than an original Snickers bar. It doesn't deviate too much from the regular formula--it still has caramel, nougat, and peanuts--but it's chocolate nougat, chocolate caramel, and peanuts, covered all in the third type of milk chocolate. It also differentiates itself from other chocolate-and-peanut bars, since it is significantly more chewy (thanks to the nougat) and flavorful (caramel) than the standard fare. So if you, like me, enjoys a regular Snickers bar but finds it long on tasteless nougat and short on everything else, this may be a straight upgrade to your candy needs. It is certainly worth a try for those who do not like Snickers in the first place.